Final outer carving complete–beginning scraping. As you can see, the basic shape is complete. 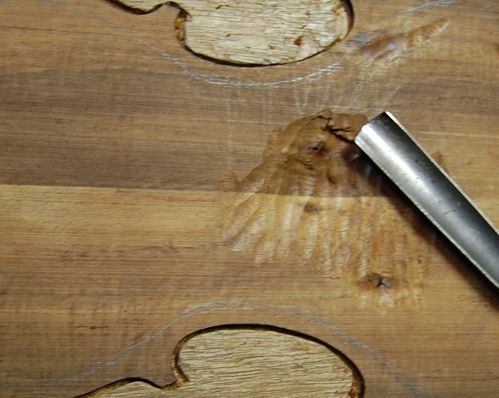 Scraping will be the method of moving wood from here on, on the outside… the inside is still a flat, rough plank. But I continued scraping for a while on the outside before beginning the inside. Back plate with scrapers: I used the “shmoo”-shaped scraper to clean around the inner bout edges and the others to establish the final shape of the outer curves. Once the plate is essentially the exact shape I want it, (checking with low-angle lights, etc.) 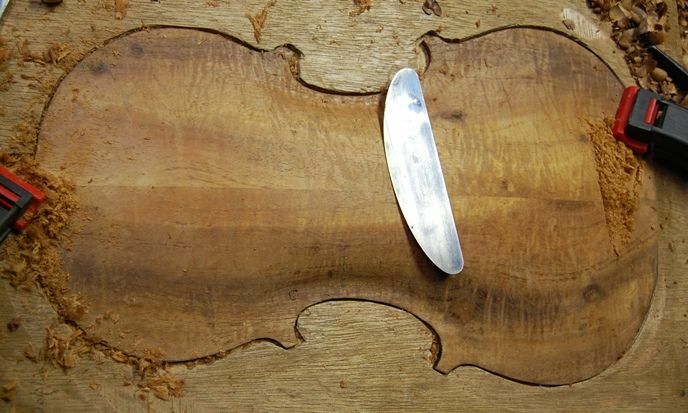 I move to finer scrapers– sharpened at 90 degrees, and used gently, flexing the blade to match the curvature of the plate. 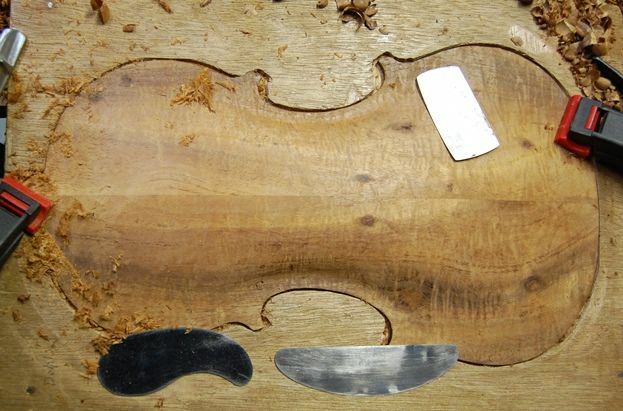 Final scraping: this is not to say that more scraping will not be done later, but that will be after the purfling is completed. This is about as far as I will go until then. 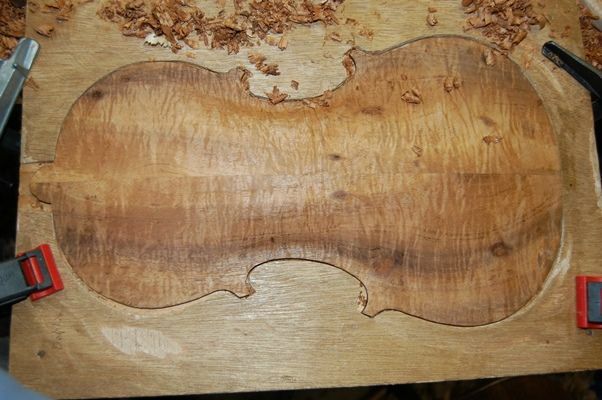 Now I can flip the plate over and begin carving out the inside of the back. Here is the cradle without the plate. Notice that the plywood cutout matches the shape of the plate fairly closely, while the thick pine board simply supports the plate while I am carving. The plywood is what holds it still, laterally. The spring clamps prevent the plate from flipping out of the cradle. 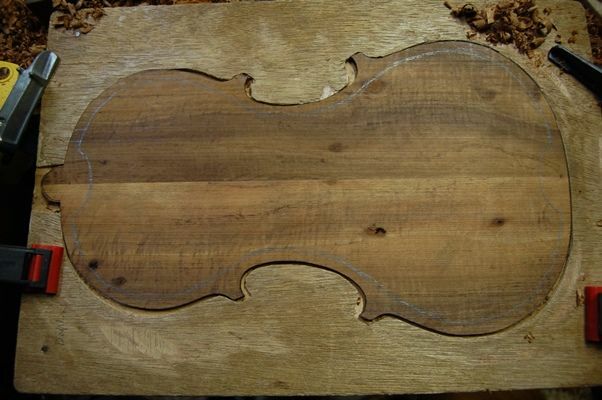 Working cradle for violins and five-string fiddles. The hollow shape allows the cradle to be used on both sides of the plate. The full-thickness cutout allows chips to drop through and not obstruct the work. 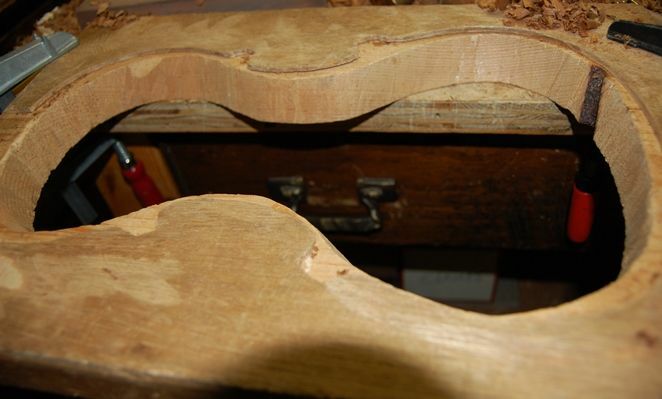 Beginning the inside arching, using a gouge again. I will post again when I am ready to install purfling. Looks very interesting on a topic I had no idea was so complex and time consuming… Chris H.
Well…hang on for the ride and you can see the whole trip!